When the MTA unveils its next five-year capital plan later this fall, the biggest ticket item will likely be a significant investment in Phase 2 of the Second Ave. Subway. It likely won’t, as I’ll discuss later this week, include funding for Staten Island projects that have been on various planners’ and advocates’ wishlists for years, and it won’t include any money for Triboro RX, that circumferential line proposed nearly 20 years ago by the RPA and talked up extensively by Elliot Sander six years back. These are projects without the right champions, but what if we took the Second Ave. approach? For better or worse, the Second Ave. Subway is a multi-phase project, broken into bite sized pieces due to the whims of politicians who couldn’t stomach a $20 billion price tag for the full line. Instead, we have four phases — only two of which are useful together. Phases 3 and 4, the southern extensions south of the connection to the 63rd St. Tunnel, wouldn’t work independently whereas Phase 1 on its own would be successful and Phase 2 an added and much needed northern bonus. The multi-phased approach leads to higher costs and redundant work, but it also means parts of the subway line will come into service much sooner than otherwise expected. As New York City struggles to expand its high speed, high capacity transit network, I wonder if the phased approach could work elsewhere, and I’m not alone. Cap’n Transit has picked up in this thread, in a way, in some posts on the Triboro RX line. What, he asked in a recent post, could be done now with a minimum amount of newbuild? The answer is plenty. Under this proposal, the L train would be split into two routes. At Broadway Junction (or maybe Halsey Street) they would diverge, with one continuing to the L current terminus in Canarsie. The other branch, which I’ll call the O train, would travel parallel to the L within the right-of-way of the Bay Ridge Branch, skipping a few stops but connecting to the 3 train at Junius Street. It would then follow the Bay Ridge Branch west through past Brooklyn College (with a transfer to the 2 train), terminating at the Brighton Line with a transfer to the Avenue H station. This is only one possibility. Another way to handle it would be to run the B trains 24/7, turning them east on the Bay Ridge Branch to Broadway Junction – although riders in Brighton Beach and Sheepshead Bay would probably complain about losing express service. 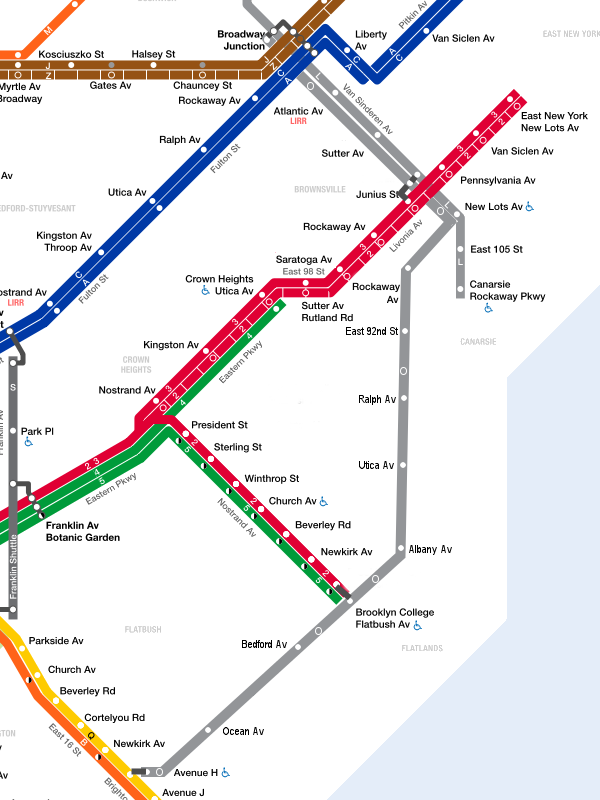 A third would be to have the O and B trains overlap, providing more frequent service. That seems to be all that can reasonably be done with the existing trackage without sharing tracks with freight trains or pouring lots of concrete. There is a four-track section between Broadway Junction and Fresh Pond Yard, but there’s not much reason to send L (or J or C) trains up there. If you’ve ever taken the M to the end of the line you’ll understand why – it’s not much of a destination. Running trains on this section would bring train service to a large section of Brooklyn that currently has none, and provide access to potential sites for new housing in these areas. There is no need to wait for a full build of the “TriboroRx” line – that was just somebody’s idea. It should be explored now. Building out new stations and retrofitting existing ones for a parallel train service wouldn’t come cheap; you can take a look at the state of the ROW in an old Forgotten NY post. But then again, neither will building out the entire Triboro RX, and the political and economic barriers currently preventing any real planning work will exist into the foreseeable future. But by chopping this project up into pieces, it’s easier for local champions to carry the torch, and it’s easier to find the money to make it one step closer to a reality. As Cap’n Transit noted, there’s no need to wait until some faraway time when Triboro RX becomes a priority (because that time is, more likely than not, never). Let’s start working on smaller pieces today. A 2008 MTA presentation on the agency’s 40th anniversary previewed a circumferential subway route. For some reason or another, the 2013 Mayoral campaign has taken a turn for the water. While the MTA is beginning to take a serious look at forecasting transit demand, the front-running Anthony Weiner and Christine Quinn are trying to out-do each other on ferry proposals. It’s a transit policy focused around gimmicks rather than solutions. The latest wacky idea in a campaign filled with them comes from Christine Quinn. In order to pander to voters supposedly improve commutes for people who I guess work at the Intrepid, Quinn has proposed an express ferry from Staten Island to Manhattan’s Pier 79 near 39th St. and the West Side Highway. Quinn claims such a ferry service would “help spur job growth and economic development on both Staten Island and on Manhattan’s Westside” and would offer a “20-minute direct access to midtown Manhattan.” To provide access to Manhattan’s actual job core, Quinn suggests subsidized bus shuttles or Citi Bike expansion. Never mind that a new subway station is opening in 11 months but half a mile away from the ferry terminal. To garner support for this plan, Quinn points to the runaway success of the East River Ferries, but even that seems to be overstated. These ferries — with a fare structure separate and apart from the subway — have drawn 2.1 million riders in two years which averages out to just under 3000 a day. That’s essentially the equivalent of a whopping three peak-hour subway trains. Ferries have limited utility in New York City because few people live near the water and even fewer work near the water. Without fare integration, ferries riders likely have a two-seat, two-fare ride to get to work, and even if Quinn can deliver a ride to Midtown that’s five minutes shorter than the current SI ferry to Whitehall, riders will still have to make the trek across Manhattan to get to work. Ferries may help out a handful of SI commuters in this instance, but they simply do not solve the city’s overarching mobility and transit expansion problems. One project the mayoral candidates could focus on instead of ferries involves an abandoned right-of-way that stretches through numerous boroughs. Over the years, I’ve examined the Triboro RX in many contexts. Lee Sander discussed itdrew comparisons between the London’s new orbital line and the Triboro RX ROW. The line would carry around 75,000 passengers per day, and it’s one that could be implemented relatively easily. Eric Jaffe at The Atlantic Cities examined the Triboro RX idea yesterday and determined that it is a far more valuable long-term growth project than ferries. “I think there’s an awful lot of transportation projects that are unimportant that people are talking about,” Jeff Zupan of the Regional Plan Association said. “On the other side of the coin, here’s one that has all the makings of being a real winner.” The RPA has been a major proponent of the Triboro RX route for nearly two decades. The sheer extent of the line, Census commute patterns for the outer boroughs, the general high rate of transit use among immigrants — all these elements point to Triboro Rx becoming a big hit…”There’s a number of things that suggest that the Triboro Rx’s time is closer to coming than it was in 1996,” says Zupan. Despite all its promise, the Triboro Rx still has a number of obstacles in its path. The project could conflict with the proposed cross-harbor rail tunnel beloved by U.S. Congressman Jerrold Nadler of New York. The Federal Railroad Administration has requirements for tracks shared by freight and passenger rail that initial plans might not meet. The MTA recently told Dana Rubinstein of Capital NY that it “never formally backed” the X line concept. The stumbling blocks are formidable, and it’s much easier for a mayoral candidate to avoid land-based transit projects during campaigns. After all, some people won’t endorse a new train line running through their backyards or while adding a ferry route isn’t nearly as disruptive as building out a train line. Still, the Triboro RX line could happen if any politician were willing to take a risk, and the current plan can even snake just across the Narrows to deliver a subway connection to Staten Island. It’s a far more useful transit expansion designed to meet the long-term growth patterns of the city, and it’s not a boat.